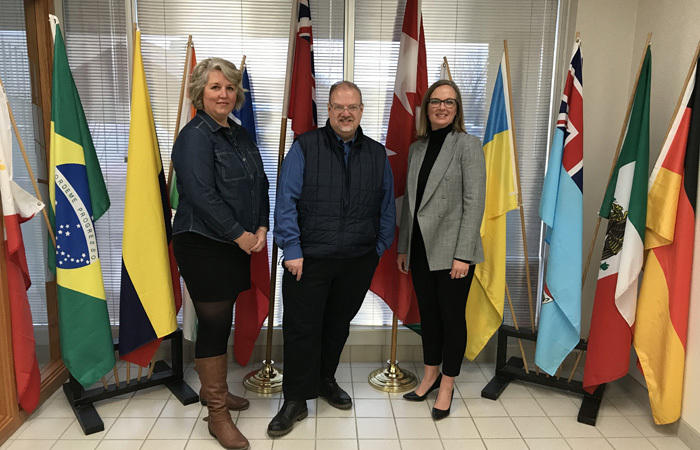 Josie Fast - Program Director for Eastman Immigrant Services, Kelvin Goertzen - Minister of Education and Training and Michelle Bezditny - Executive Director for Steinbach Chamber of Commerce / Eastman Immigrant Services. Steinbach MLA and Education and Training Minister Kelvin Goertzen announced that the province is investing up to $3.1 million in services that support newcomers to Manitoba. The province is reinvesting revenue generated by Manitoba Provincial Nominee Program (MPNP) application fees into 17 organizations across the province. In November 2016, the province announced MPNP enhancements to eliminate a backlog in processing times, fast-track nominations and reinvest revenue generated by a new $500 application fee for skilled workers and existing $2,500 application fees for businesses. The reinvestment would help immigrants and refugees integrate and settle in the province at no additional cost to Manitobans. The province is entering into agreements with 17 agencies that include Manitoba Interfaith Immigration Council – Welcome Place in Winnipeg and Eastman Immigrant Services in Steinbach. The province held several newcomer roundtable consultations to identify which service areas could benefit from strategic investments. Participants recommended programming to better integrate newcomers with multiple barriers or special needs, as well as targeted supports for newcomer youth and families that face unique challenges.